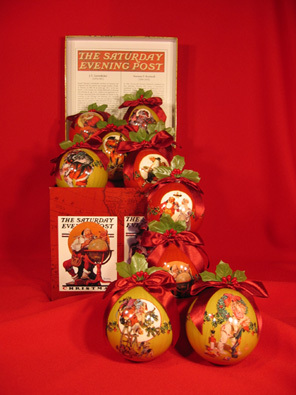 Five decoupage ornaments with Norman Rockwell illustrations and five with J.C. Leyendecker illustrations. All ten of the illustrations are also represented on the box. On the inside of the box lid are brief bio's of Norman Rockwell and J.C. Leyendecker. Each ornament as a ribbon, holly berries and leaves. Ornaments 3”, box 8 ¼” square.